We already know Prime Day was huge this year. Just yesterday Amazon announced Prime Day 2018 was, among its selling events to date, the “biggest in history.” In all, Amazon sold more than 100 million products. But as we look to debrief Prime Day 2018, so far all we really have is figures to go by—figures about how much was spent, how many products were sold, and what categories were purchased. How satisfied were Prime members with the deals at Amazon and Whole Foods? Why didn’t some Prime members participate in the event? Did Amazon’s technical difficulties influence how much shoppers spent? Were non-Prime, Amazon shoppers bummed they couldn’t participate in Prime Day? Did shoppers use Prime Day deals to price-match with other retailers? Did shoppers take advantage of deep discounts and limited-time promotions offered by other retailers to compete with Prime Day? 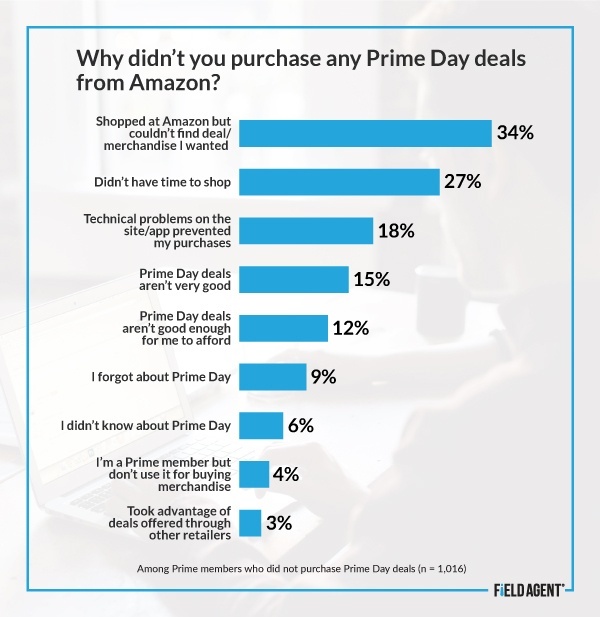 As Prime Day 2018 came to a close, Field Agent launched a “rapid response” survey to 2,451 U.S. adults* about their Prime Day participation, behaviors, and attitudes, with questions for Prime members and non-members alike. 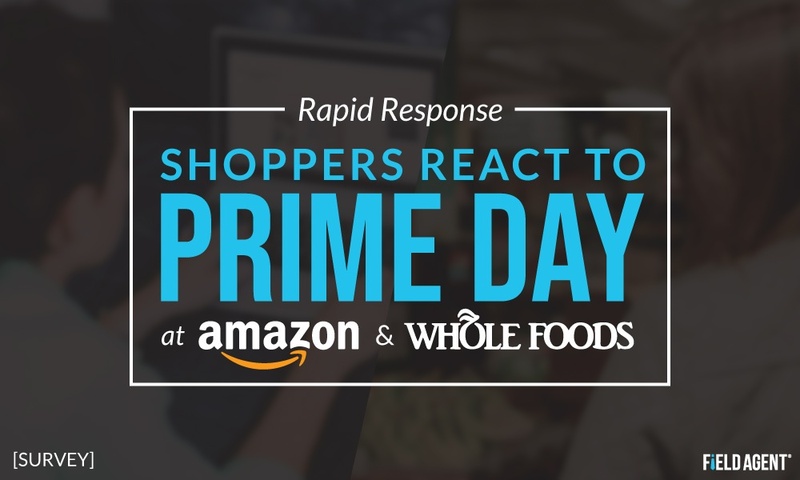 We also took occasion to ask shoppers about the Prime Day deals at Whole Foods Market, and to gauge their participation in Prime Day-alternative specials offered through competing retailers. * All respondents were U.S. adults and smartphone owners at least 18 years of age. 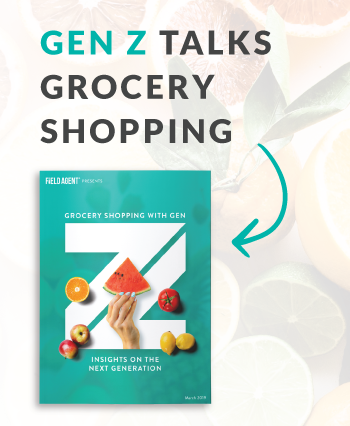 Field Agent surveyed a crowdsourced sample of 2,451 consumers across all 50 states, conducted July 18, 2018-July 19, 2018. The survey was completed entirely through the Field Agent mobile app. Demos -- Gender: female (68%), male: (32%); Age: 18-24 (4%), 25-34 (28%), 35-44 (36%), 45-54 (21%), 55-64 (9%), 65+ (2%); Ethnicity: Caucasian or some combo (77%), African-American or some combo (11%), Hispanic or some combo (6%), other (4%); Household income: <$35,000 (24%), $35-49K (22%), $50-74K (25%), $75-99K (12%), $100-124K (8%), $125-149K (4%), $150K+ (5%). Below we share several highlights from this survey as a 10-question QuickFire Q&A. 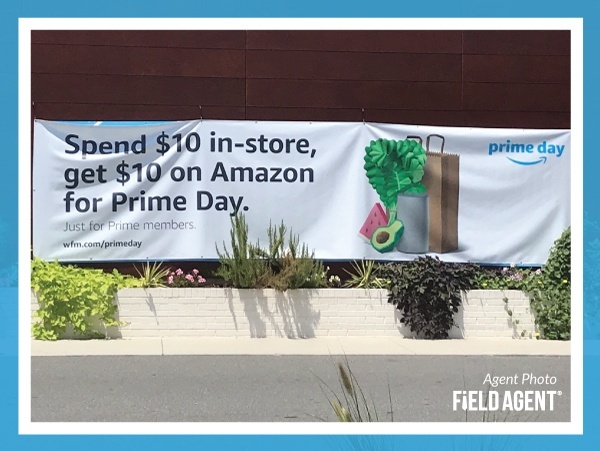 But first take a look at the agent video below, offering sights and sounds from Prime Day 2018 inside Whole Foods Market. 1. How many shoppers participated in Prime Day 2018? Of Prime members in Field Agent's survey (n = 1,410), fully 79% visited Amazon.com or the Amazon mobile app between July 16 (beginning at 3 p.m. EST) and July 17. Moreover, 28% of Prime members in the survey reported purchasing a Prime Day deal. This 28% only encompasses bona fide Prime Day deals, and does not include all purchases made by Prime members on Prime Day (i.e., the figure does not reflect merchandise purchased at regular Amazon prices). 2. What did Prime Day shoppers purchase? Among Prime members who purchased Prime Day deals on Monday and Tuesday (n = 395), 55% purchased more than $50 on Prime deals, while 32% bought more than $100. Only 2% in our survey spent more than $500. But given all this spending, what exactly was being bought? In Field Agent’s survey, 27% of Prime members (who purchased Prime Day deals; n = 395) said they bought non-Amazon electronics like TVs, speakers, and computers, while another 21% purchased Amazon-branded electronic devices like Echo, Kindle, etc. 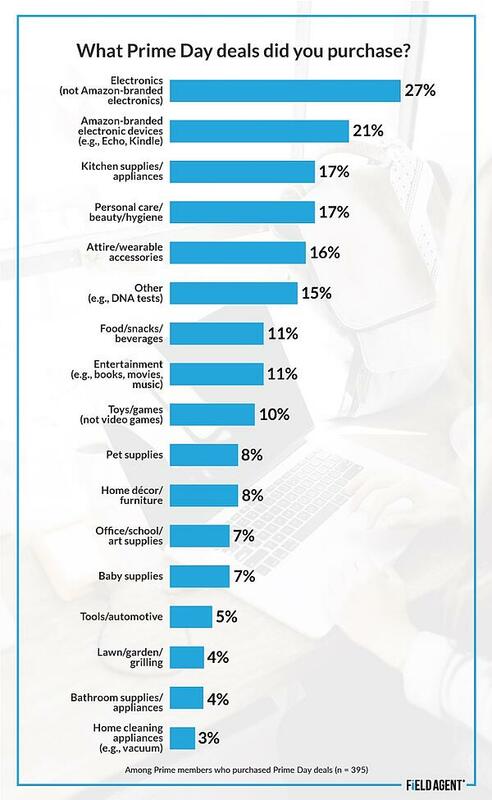 Behind electronics, purchases of kitchen supplies/appliances (17%) and personal care/beauty/hygiene (17%) were most common, followed by attire and wearable accessories (16%). 3. Were Prime members satisfied with Amazon’s Prime Day deals? Of Prime members who made Prime Day purchases (n = 395), 49% said they were either extremely or very satisfied with the deals offered, and another 40% were moderately satisfied. This leaves 15% who were left relatively unimpressed—either not very or not at all satisfied. But this was among Prime members who actually purchased Prime Day deals. 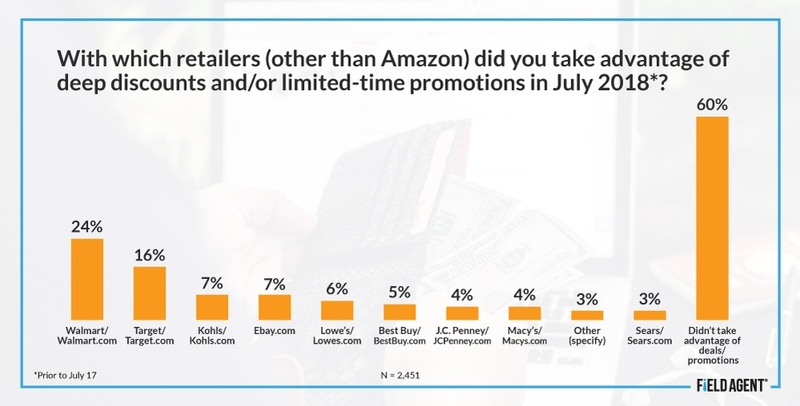 As for Prime members who did not purchase any deals on Prime Day, 34% indicated they shopped Amazon's website/app but “couldn’t find any deals/merchandise [they] wanted.” More to come on these shoppers. 4. How did non-Prime, Amazon shoppers feel about being left out on Prime Day? We wondered, do non-Prime members press their faces against the glass of their computers and phones on Prime Day, wishing—just wishing—they too could enjoy Prime Day deals? 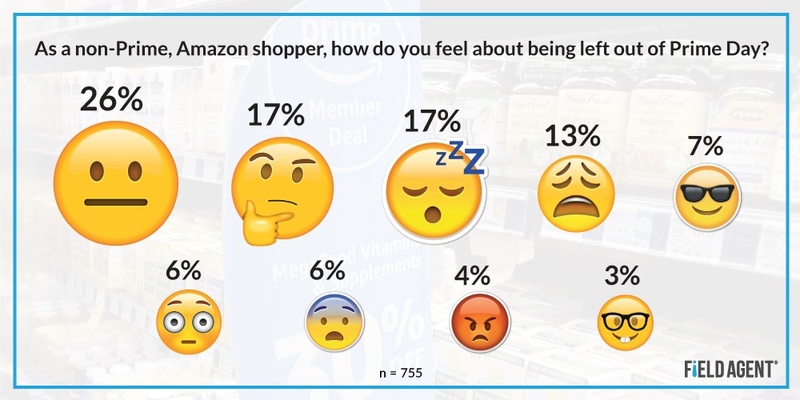 We ultimately surveyed 755 Amazon shoppers (i.e., individuals who make purchases from the online giant at least once a year) who were not Prime members at the time of the survey. As you can see, the top choices included fairly neutral emojis. And this didn’t change as awareness of Prime Day increased. Forty-seven percent of non-Prime members who shop with Amazon at least once a year (n = 755) said they were completely or very aware of Prime Day—they knew the shopping event existed and largely what it entailed. Another 26% were moderately aware. The survey also asked these non-Prime, Amazon shoppers (n = 755) to rank five Prime benefits by they're appeal. At 31%, Prime Day participation received the third highest percentage of #1 and #2 rankings, behind free two-day shipping (80%) and free streaming movies (50%) but in front of streaming music (22%) and "everyday" Whole Foods discounts (18%). The results, then, suggest many non-Prime, Amazon shoppers would clearly like to participate in Prime Day, only they're not exactly picketing for the opportunity. 5. Did technical difficulties influence how much shoppers spent with Amazon? Certain technical difficulties, experienced by some shoppers on Amazon’s website and app, represent one of the top storylines in the wake of Amazon’s fourth annual Prime Day. But just how many shoppers experienced technical difficulty? Among the 1,447 respondents in our survey who visited Amazon’s website or app during the 36-hour shopping event, including both Prime and non-Prime Amazon shoppers, 43% reported experiencing one or more technical issues. Forty-eight percent of Prime members who visited Amazon's website or app on Prime Day encountered a technical problem. 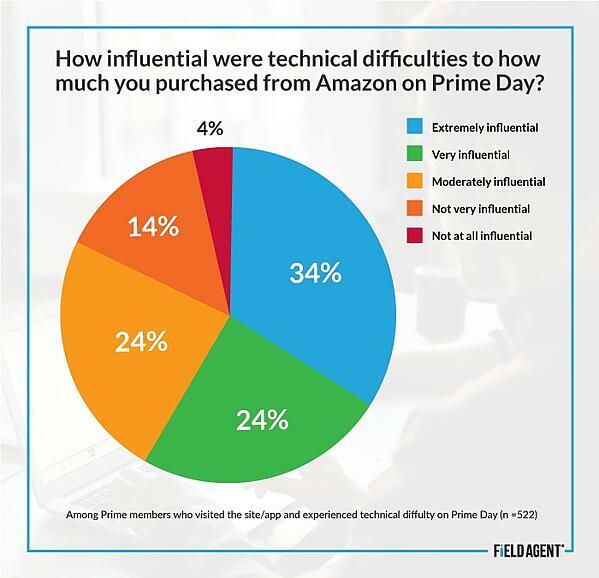 Significantly, of Prime members who experienced problems of some kind, the majority (58%) said these technical issues were extremely or very influential to how much they spent with Amazon. An additional 24% indicated the technical problems were moderately influential. As you’ll see below, among Prime members who didn’t make a purchase on Prime Day, technical problems were in the top three reasons for not buying a Prime Day deal. Thus, as successful as Prime Day 2018 may have been for Amazon, this survey suggests technical problems could have been costly. 6. Why didn’t some Prime members make purchases? Technical hiccups were a factor in why some Prime members didn’t make purchases on Prime Day, but they weren’t the top cause of non-conversions. Of 1,015 Prime members who did not purchase any Prime Day deals, 34% said they visited Amazon's website/app but simply couldn't find any deals/merchandise they wanted, and another 27% indicated they were just busy with other things and thus couldn't shop. The chart shows other reasons Prime members gave for not jumping on Prime Day deals. 7. Did Amazon just cannibalize its own sales with Prime Day, or intercept sales from other retailers? Here’s a good question: How much in the way of additional sales does Prime Day generate for Amazon? I mean, are these purchases shoppers would make from Amazon anyway, even without the Prime Day deals? Thirty-six percent of those who made Prime Day purchases on the Amazon website or app (n = 395) said they would have, most likely, made all of these purchases with Amazon at some point regardless. 8. Did shoppers use Prime Day as an opportunity to price-match with other retailers? 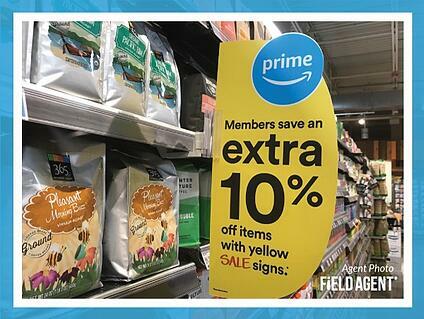 Among all shoppers surveyed by Field Agent (N = 2,451), 5% said they found a Prime Day deal they then used to obtain a price-match from a different, non-Amazon retailer. 9. What did shoppers think of Whole Foods’ Prime Day special? In our survey, 14% of Prime members who shop at Whole Foods (n = 712) said they participated in Whole Foods’ Prime Day deals or promotions. The most popular promotion? Spend at least $10 at Whole Foods, get a $10 credit toward Amazon’s digital Prime Day deals (as pictured). 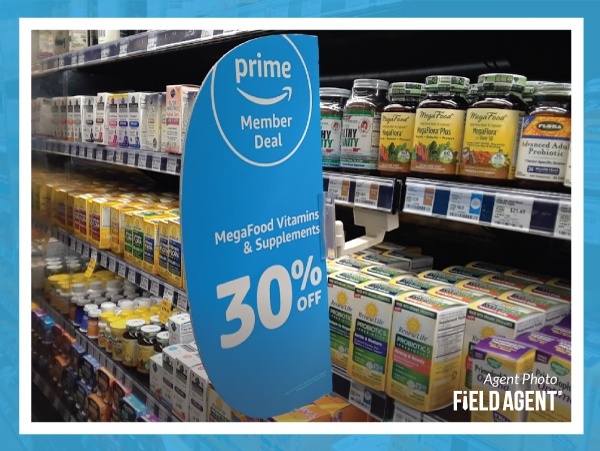 Seventy-four percent of those who participated in Whole Foods’ Prime Day (n = 98) said they took advantage of this promotion, while another 44% indicated they purchased produce, meat, or packaged groceries with deeper-than-usual discounts exclusively for Prime members. Good news for Whole Foods: Shoppers generally liked what they saw. Of those who participated in Whole Foods’ Prime Day deals or promotions, the majority, 71%, were extremely or very satisfied with the quality of deals/promos. It’s probably worth noting that among Prime members who shop at Whole Foods (and have convenient, local access) but did not take advantage of the grocer’s Prime Day offerings (n = 614), 47% indicated they simply did not know the deals were available and another 25% agreed they "didn't need to go grocery shopping while the deals were available." See the video above for sights and sounds from Whole Foods’ first Prime Day. 10. Did shoppers take advantage of other retailers’ alternatives to Prime Day deals and promotions? As many news outlets reported, this year, many of Amazon’s competitors—Walmart, Target, eBay, etc.—paraded out their own Prime-alternative discounts and/or promotions. So we asked respondents, “With which retailers, if any, did you make purchases in July 2018 specifically to take advantage of deep discounts or special limited-time promotions?” Of course, these purchases would have been made during or prior to Prime Day. As you can see below, Walmart (24%) and Target (16%) both benefited, it seems, from the buzz surrounding Prime Day and online-shopping in general. Truly, it will be interesting to observe whether Prime Day transitions into a broader Christmas-in-July event, as more retailers attempt to stave off the growth of Amazon’s Prime Day.